VERY FINE APPEARANCE. 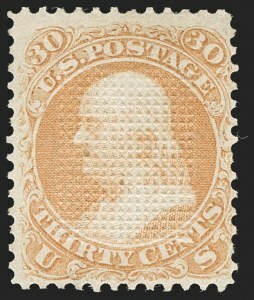 BY FAR THE FINER OF ONLY TWO RECORDED EXAMPLES OF THE ONE-CENT 1867-68 ISSUE WITH POINTS DOWN C GRILL. The 11 stamps in this section form the unique complete set of each of the six denominations that exist with the essay C Grill, comprising the 1c, 3c, 5c, 10c, 12c, and 30c values. 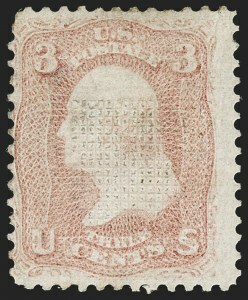 This 1c shows points down (it exists only in this state) and the other denominations include two examples each, one with points up and one with points down. The grills are clear 13 x 16mm male grills (16 points x 19-19.5 points) made up of tiny "X" pyramidal points impressed into the face or into the back (creating points down or up on the face). This male grill differs from the issued C Grill (Scott 83), which was made by a female grill surface of embossed depressions. 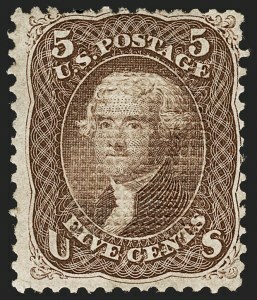 When applied to the sheet, facing toward the depressions, the female C Grill created raised bosses on the face of each stamp. These C Grill essays originate from the archive of papers and stamps retained by Charles F. Steel, who patented the grilling device. 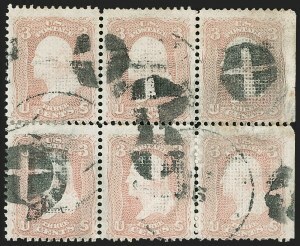 The various experimental grilled stamps were acquired by James Ludovic Lindsay, the 26th Earl of Crawford, from the Steel archive. 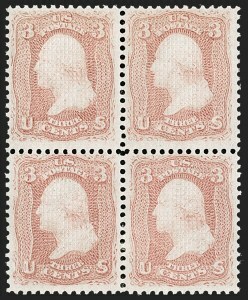 The stamps in this set were subsequently part of the Col. Edward H. R. Green collection (offered in Part XXV, Costales sale, Feb. 18-21, 1946, lots 204-213). 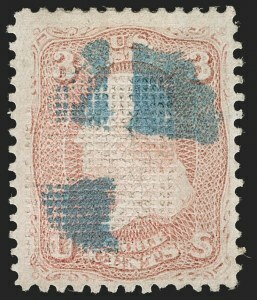 In the Costales sale catalogue it was stated that apart from the 1c, which was previously known, the existence of the other denominations was unknown until the Green dispersal. They were later owned by essay-proof pioneer Clarence M. Brazer, from whose family Mr. Drews acquired the set. Each of the stamps in this unique set has been off the market for decades. Each of these C Grills is believed to be unique, except there is a second 1c with points down (and serious faults) which appeared in the Worthington sale and was later owned by Jerome S. Wagshal (Siegel Sale 993, lot 448). A 1c with points up has never emerged. For more more information about the origins of the experimental A and C grills, please refer to Chronicle 134 and to our Siegel Encyclopedia at http://siegelauctions.com/enc/pdf/1867.pdf. Steel, Earl of Crawford, Col. Green and Brazer. FINE. 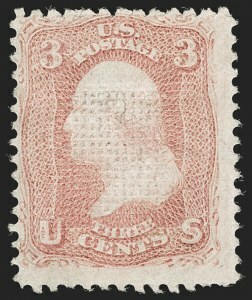 THE UNIQUE EXAMPLE OF THE 3-CENT 1867-68 ISSUE WITH POINTS UP C GRILL. 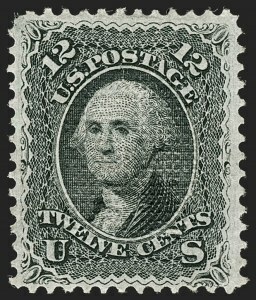 The 11 stamps in this section form the unique complete set of each of the six denominations that exist with the essay C Grill, comprising the 1c, 3c, 5c, 10c, 12c, and 30c values. The 1c shows points down (it exists only in this state) and the other denominations include two examples each, one with points up and one with points down. The grills are clear 13 x 16mm male grills (16 points x 19-19-1/2 points) made up of tiny "X" pyramidal points impressed into the face or into the back (creating points down or up on the face). This male grill differs from the issued C Grill (Scott 83), which was made by a female grill surface of embossed depressions. 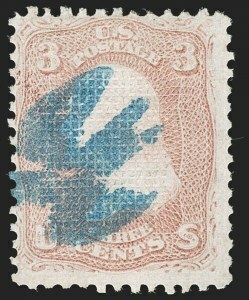 When applied to the sheet, facing toward the depressions, the female C Grill created raised bosses on the face of each stamp. VERY FINE APPEARANCE. 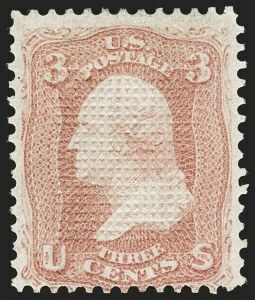 THE UNIQUE EXAMPLE OF THE 3-CENT 1867-68 ISSUE WITH POINTS DOWN C GRILL. FINE. 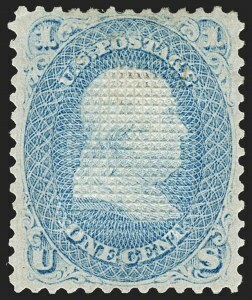 THE UNIQUE EXAMPLE OF THE 5-CENT 1867-68 ISSUE WITH POINTS UP C GRILL. FINE. 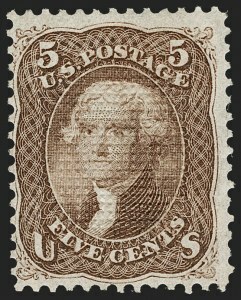 THE UNIQUE EXAMPLE OF THE 5-CENT 1867-68 ISSUE WITH POINTS DOWN C GRILL. FINE. 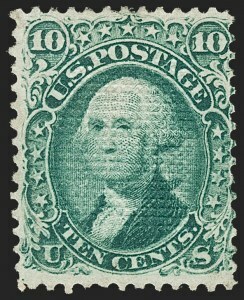 THE UNIQUE EXAMPLE OF THE 10-CENT 1867-68 ISSUE WITH POINTS UP C GRILL. FINE APPEARANCE. 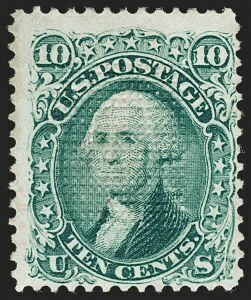 THE UNIQUE EXAMPLE OF THE 10-CENT 1867-68 ISSUE WITH POINTS DOWN C GRILL. FINE APPEARANCE. 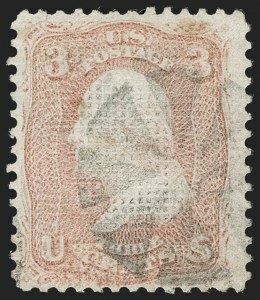 THE UNIQUE EXAMPLE OF THE 12-CENT 1867-68 ISSUE WITH POINTS UP C GRILL. VERY FINE APPEARANCE. 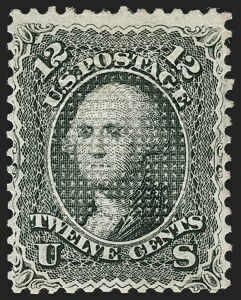 THE UNIQUE EXAMPLE OF THE 12-CENT 1867-68 ISSUE WITH POINTS DOWN C GRILL. FINE APPEARANCE. 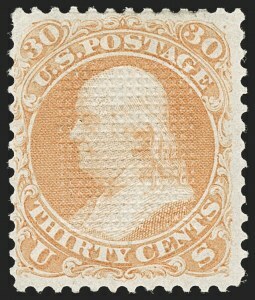 THE UNIQUE EXAMPLE OF THE 30-CENT 1867-68 ISSUE WITH POINTS UP C GRILL. FINE. 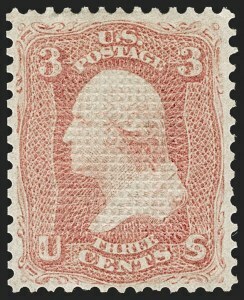 THE UNIQUE EXAMPLE OF THE 30-CENT 1867-68 ISSUE WITH POINTS DOWN C GRILL. FRESH AND FINE. A REMARKABLY RARE ORIGINAL-GUM BLOCK OF FOUR OF THE 1867 3-CENT C GRILL. VERY FEW BLOCKS OF THIS ISSUE REMAIN INTACT. 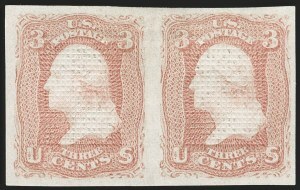 The 3c is the only issued denomination that comes with the distinctive C Grill, which was made from the female A Grill device with the grill embossing modified to fit within each stamp (it was usually applied points up). Very few blocks are known, as most have been broken to feed the market for singles. VERY FINE. A RARE EXAMPLE OF THE ONE-CENT 1867 C GRILL WITH A DOUBLE GRILL. FINE APPEARANCE. 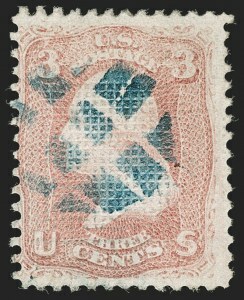 THIS IS REPUTED TO BE THE LARGEST USED MULTIPLE OF THE 1867 3-CENT C GRILL.